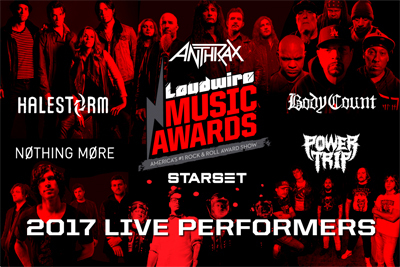 LOUDWIRE MUSIC AWARDS--the ultimate rock 'n' roll award ceremony and concert announced today ANTHRAX and NOTHING MORE will perform alongside previously announced artists ICE-T & BODY COUNT, HALESTORM, STARSET and POWER TRIP in addition to a special guest performance from ROB HALFORD. Tickets for the rock 'n' roll concert event on Tuesday, October 24 at The Novo in downtown Los Angeles are on-sale now at: LOUDWIREAWARDS.COM. "All of us in ANTHRAX are honored to be included in this year's Loudwire Music Awards, both as nominees in the Best Live Band category, and with a special performance at the show," says Charlie Benante of ANTHRAX. "The Loudwire Music Awards is a celebration of OUR music, and the support that Loudwire has given to all of us in hard rock, metal and thrash is really appreciated. We take pride in our live show as it's always a chance for us to connect with the audience, and we hope to bring the Loudwire Awards to a metalized frenzy with the special live set we're planning." "Loudwire is on the forefront of rock, always sharing news about the best things in our genre," adds NOTHING MORE frontman Jonny Hawkins, adding, "so we're honored that they asked us to do this show... Can't wait!" "Thanks to Apple Music, the international hard rock and heavy metal community can vote for these incredible artists in an entirely new way," says Josh Bernstein, Director of Live Events for Townsquare Media "Supporting their favorites and discovering new talent through playlists curated by Loudwire's highly trusted editorial team." This year Loudwire's staff opened up the band/artist nomination process by inviting the input of hard rock & heavy metal's top managers, publicists, DJs, agents, A&R reps, festival promoters and the artists themselves. The 2017 Loudwire Music Awards nominee class sees multiple nominations for industry heavyweights like METALLICA, IRON MAIDEN, AVENGED SEVENFOLD, and exciting newcomers POWER TRIP, CODE ORANGE, and FRANK CARTER & THE RATTLESNAKES. Readers are able to vote in multiple awards categories, including Album and Artist of the Year at: LOUDWIREAWARDS.COM. Nothing More "Go To War"
Of Mice & Men "Unbreakable"
DragonForce "Ashes Of The Dawn"
Pallbearer "I Saw The End"
Power Trip "Executioner's Tax (Swing Of The Axe)"